Argentina stretches 4,000 km from its sub-tropical north to the sub-antarctic south. Its terrain includes part of the Andes mountain range, swamps, the plains of the Pampas and a long coastline. Its people have had to struggle with military dictatorship, a lost war over the Falkland Islands, and severe economic difficulties. Argentina is rich in resources, has a well-educated workforce and is one of South America's largest economies. But it has also fallen prey to a boom and bust cycle. A deep recession foreshadowed economic collapse in 2001. This left more than half the population living in poverty and triggered unrest. The country struggled with record debt defaults and currency devaluation. By 2003 a recovery was under way, and the International Monetary Fund (IMF) agreed to a vital new loan. Since then, Argentina has restructured its massive debt, offering creditors new bonds for the defaulted ones, and has repaid its debt to the IMF. But with poverty rife and unemployment high, many Argentines still await the benefits of the economic upturn. Argentina remains locked in a territorial dispute with Britain over the Falklands Islands, which are governed as a British overseas territory, but have been claimed by Buenos Aires since the 1830s. The issue led to war in 1982, when the islands fell to an invasion launched by Argentina's military junta, but were re-conquered by Britain in a conflict that caused hundreds of deaths on both sides. The defeat led to the fall of the military dictatorship, but the junta's legacy is still an open wound. Tens of thousands of people were killed in the seven-year "dirty war". The bodies of many abductees - known as the "disappeared" - have never been found. Amnesties which protected former junta members from prosecution have been repealed and the legality of pardons granted to military leaders in the 1980s and 1990s is being questioned. 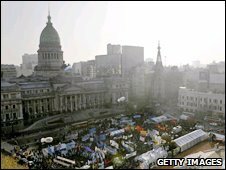 Cristina Fernandez swept to victory in the first round of Argentina's presidential election in October 2007 - a victory that many attributed to the popularity of her husband, the then President Nestor Kirchner. She fought the election campaign largely on Mr Kirchner's record of reducing poverty and unemployment in the wake of the 2001-2002 economic crisis - one of the worst the country had ever experienced. But she faced a difficult start to her first term. Soon after being elected, her popularity dropped to 20% as a result of disputes with farmers and media groups. It also was widely believed that before his death in 2010, her husband, who was expected to stand again for the presidency, still ran the country behind the scenes. They suffered a setback in legislative elections in 2009, when their Peronist party lost control of both houses of Congress and Mr Kirchner was beaten in his high-profile bid for a seat in Buenos Aires province, a Peronist stronghold. However, bouyed by a booming economy, Ms Fernandez was re-elected to a second term with a landslide 54% of the vote in October 2011. Her closest challenger won only 17%. In January 2012, Ms Fernandez underwent surgery to remove her thyroid gland because of suspected cancer that proved to be benign. Ms Fernandez was active in a leftist Peronist movement as a law student in the 1970s, later becoming first a provincial and then a national deputy. She supported her husband - whom she met at university in 1975 - as he rose through the Peronist ranks, and in 1995 became a senator herself. 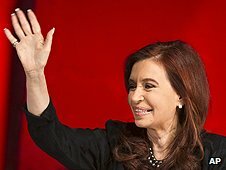 After Mr Kirchner was elected president in 2003, she was his chief adviser, and he also played an important role in her leadership. One of his first jobs was to help with negotiations to release hostages held by the guerrillas in the Colombian jungle. The couple were dubbed "the Clintons of the South", and Ms Fernandez encouraged the comparison by alluding to the similarities between herself and Hillary Clinton during her election campaign. Argentina is one of South America's leading media markets. The country has well over 150 daily newspapers, many hundreds of commercial radio stations, dozens of TV stations and one of the world's highest take-up rates for cable TV. Large media conglomerates have emerged. Public broadcasting plays a minor role. Television is the dominant medium. The main national free-to-air networks - Telefe, America, Canal 9 and Canal 13 - are privately-owned. Argentine readers are among Latin America's most voracious newspaper consumers. Clarin and La Nacion are the best-selling national dailies. Media freedom is guaranteed by the constitution. However, US-based Freedom House says the poor relationship between the government and the media is an obstacle to journalism. In particular, it cites "open hostility" towards the media giant, Grupo Clarin. Tactics used to "silence" the group have included blocking newspaper distribution and interfering with newsprint supplies. By December 2011, Argentina had 28 million internet users, comprising 67% of the population (Internetworldstats.com) and giving the country the second-highest number of surfers on the continent, after Brazil.